Why are we discussing energy policy? Three different motivations drive today’s energy discussions. we should save them for better uses than simply setting ﬁre to them. Going by ﬁgure 1.2, it certainly looks as if “our” fossil fuels have peaked. supply, if adequate plans are not implemented. Third, it’s very probable that using fossil fuels changes the climate. fossil-fuel burning. And the main reason we burn fossil fuels is for energy. So to ﬁx climate change, we need to sort out a new way of getting energy. The climate problem is mostly an energy problem. bers, and policies that add up. creases average global temperatures (and has many other effects). Figure 1.2 Are“our” fossil fuels running out? 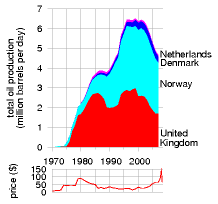 Total crude oil production from the North Sea, and oil price in 2006 dollars per barrel. Figure 1.3 The energy gap created by UK power station closures, as projected by energy company EdF. 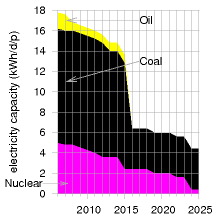 This graph shows the predicted capacity of nuclear, coal, and oil power stations, in kilowatt-hours per day per person. The capacity is the maximum deliverable power of a source.